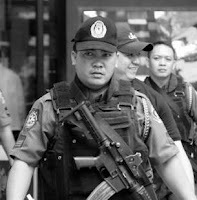 I fail to see anything about the information contained in the Wikileaks expose on the "mess" that is the Philippine National Police that I'd consider even remotely groundbreaking. Perhaps only two things make it newsworthy: (1) its source is American in origin, and (2) the detail contained in it is fit for a people renowned for their focus on people and events rather than on ideas. So basically what makes this Wikileaks indictment of the PNP interesting in the star-struck eyes of Filipinos is the fact that it lays out the tabloidesque who's who and the what's what surrounding the dysfunctional of a state service the essence of which most of us have already known of for the last several decades. Is there really any point in all that detail considering that the key and real point of it all -- the fact of the ineptitude of the PNP -- is a pointed truth that Filipinos are already unable to deal with even as it stares us all in our faces? I miss Joe Mussomeli. He was the last realistic diplomat we ever sent here.